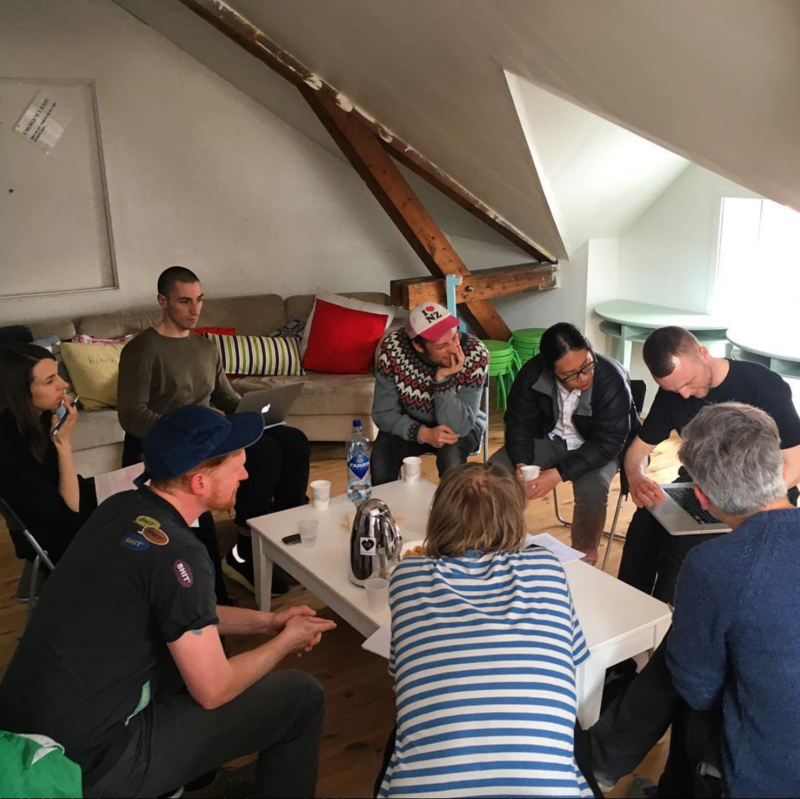 For the past year, Stavanger-based independent curator Mirja Majevski has organized a reading group and series of conversations in collaboration with the programming at local artist-run gallery Studio 17. Titled the Conversation Pit, the group loosely basis its discussions around a shared selection of texts about curating, art theory, and criticism. Below, Majevski follows varying concepts of ‘care’ and ‘friendship’ in the arts as they appear in different readings, and explores how these ideas affect self-organized spaces and curating as a whole. Conversation Pit #1. Photo: Hans Edward Hammonds. Before appearing in book format, the essays were published in Artforum magazine in 1976 and 1986. Apart from aesthetic decisions pertaining to the way that a gallery looks, it is the manner in which it operates that signals a particular value system. 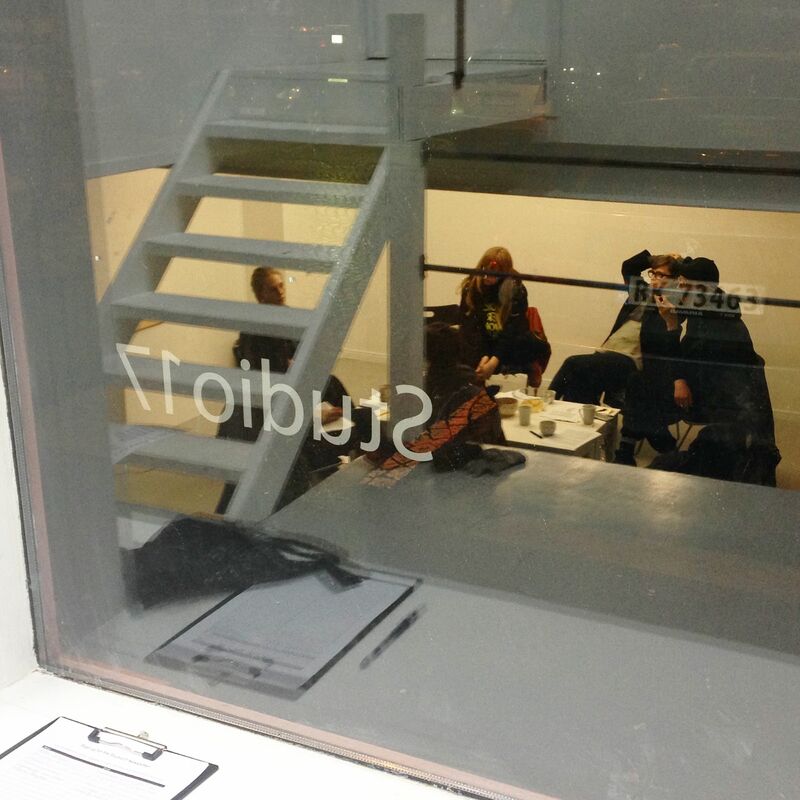 Founded in 2013 and lead by a rotating board consisting of cultural practitioners based in Rogaland, the independent exhibition space Studio17 is firmly rooted in its locale on the ground floor of Nytorget 17, 4013 Stavanger. After all, the organisation was born out of an ambition to activate the space, which had been lying dormant after Trykk 17, an artist-run gallery with a focus on printmaking that was operated by members of Grafisk Verksted, had ceased its activities the year before. The name of the organisation, where ‘Studio’ refers to the use of the space as a testing ground for new ideas, a working environment, and ’17’ denotes the house number, demonstrates the indissoluble link to the venue and the use imagined for it. 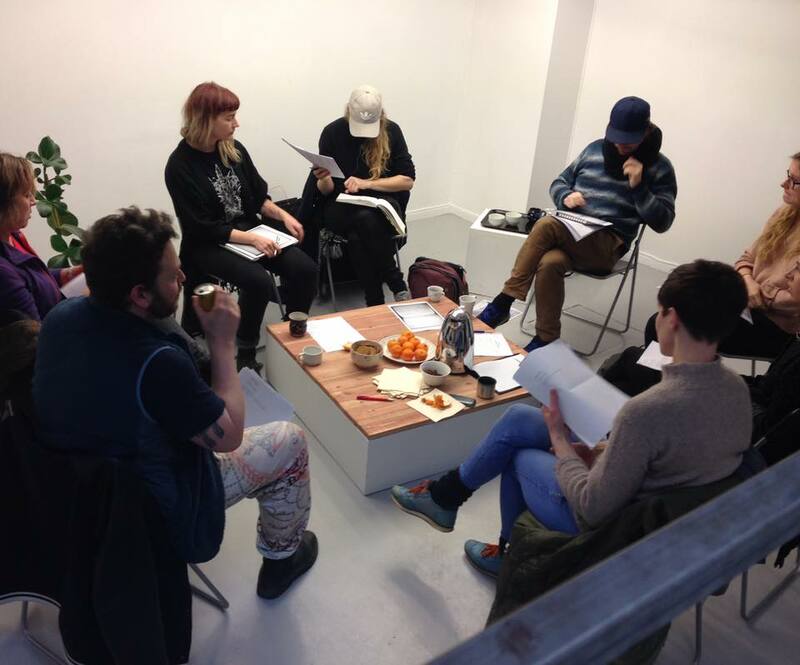 A year in advance of its fifth anniversary, Studio17 launched a reading group, called the Conversation Pit, that would undertake open-ended research into theories and practices of self-organisation. The idea stemmed from an aspiration to reflect upon what the organisation is doing and how it is doing it, and, further, to share this journey with those who use the space. Moreover, it was motivated by a desire to deliberate over cultural production both nationally and internationally and to invite collaborators and colleagues to expatiate on their outlook on the matter of self-organising. Conversation Pit #2 with Ina Hagen. Photo: Anna Ihle. The label ‘self-organising’, borrowed from systems theory and natural sciences, doesn’t have a strict definition when used in the context of the arts. 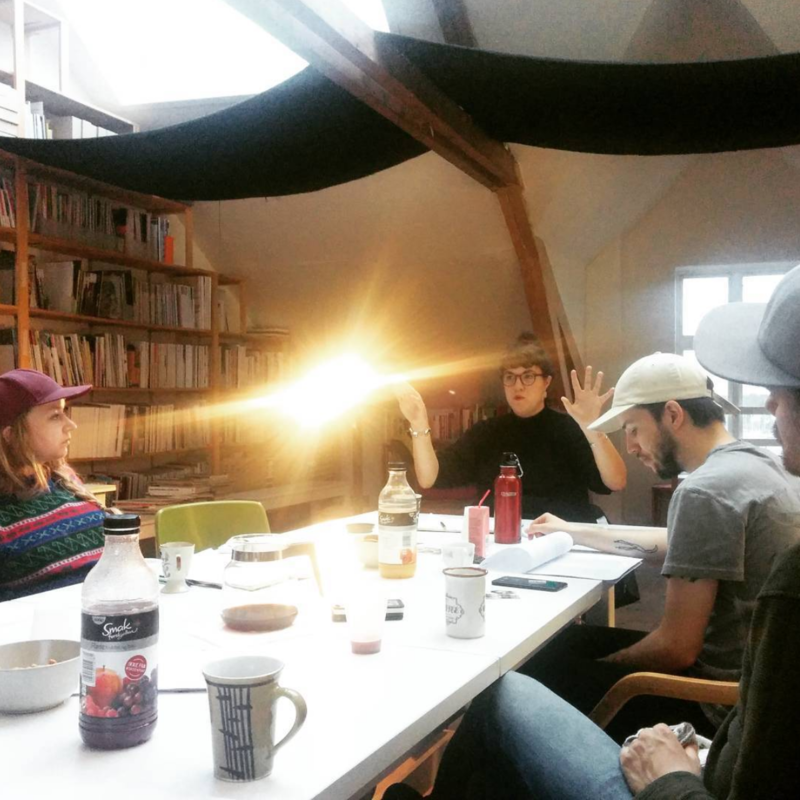 Julie Niemi, a curator and the 2017 CAS Resident in Art Writing, who led the sixth edition of the Conversation Pit, has written about the term as well as her thoughts about the reading group session in an article previously published on CAS, hence I’m not going to rehearse it here. 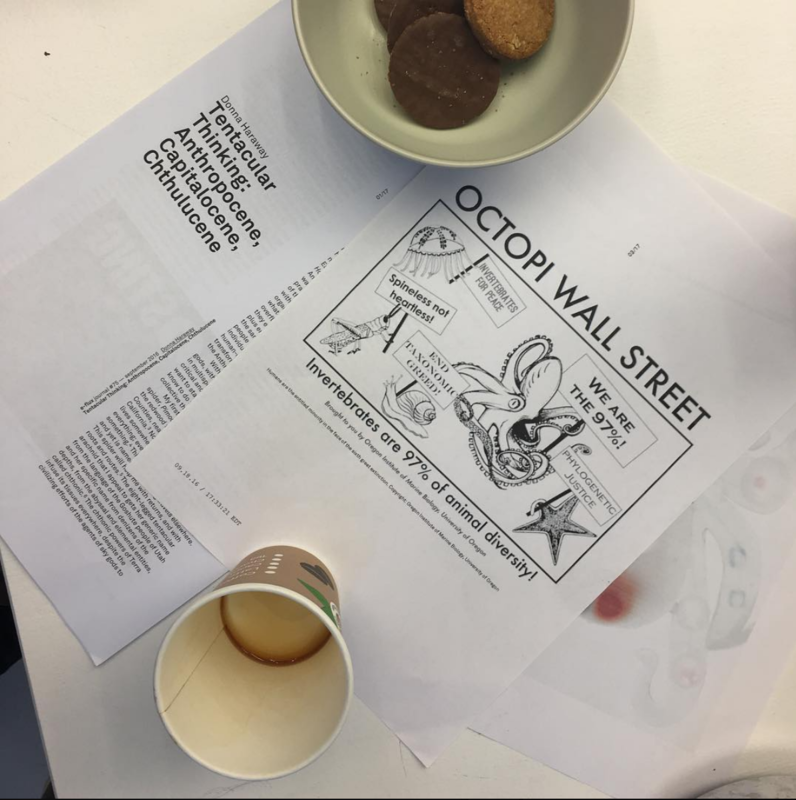 It is enough to note that, as contested as it is, the reading group chose ‘self-organising’ as a starting point because of the term’s ability to accommodate a plethora of voices and practices, everything from activist actions to neoliberal work situations, so that from the outset delimitations would be loose. It was January 2017 when we first convened under the umbrella of the Conversation Pit. On the whole, during the year the reading group assembled a total of seven times at irregular intervals. All of the meetings were open to the public and attracted a varying amount of participants. Two of the events were led by me and the rest by invited guests, each of whom was or had until recently been involved in running a self-organised initiative. Primarily the group gathered at Studio17, but on two occasions it made use of the library of Rogaland Art Centre located in the same building. For the visitors – Ina Hagen (Louise Dany), Maiken Stene (Velferden), Andreas Knaag Danielsen (Galleri CC), Julie Niemi (The Barn), and Ayatgali Tuleubek (Podium) – each of whom was invited to lead one of the reading group sessions, the brief was to choose a text or two that would reflect the way in which the initiative they are involved with was or is operated. Hence, to generalise, the chosen articles can be interpreted as mirroring ideologies and attitudes prevalent in the self-organised culture of our times. As the group considered different approaches to self-organising, there were two notions, namely ‘care’ and ‘friendship’ that kept surfacing throughout the discussions and range of reading materials. The notion of friendship initially came up as a subject matter in the first reading session, notably when addressing the writing of Céline Condorelli. And the idea of care entered soon after via Antony Huberman’s text titled Take Care that was suggested to us by Conversation Pit #2 leader Ina Hagen, co-founder of Louise Dany, an artist-run initiative in Oslo. In what follows I’ll take a closer look at these two terms, both separately and as they coalesce. Also, a related third concept is added, that is ‘networks’, which made an appearance in the Conversation Pit via Common Practice research paper Practicing Solidarity written by artist and researcher Carla Cruz. By means of friendship humans increase their vital capacities. Consequently, the fact that numerous self-organised projects are born out of friendship and regard it as an operational condition hardly comes as a surprise. Friendship can be defined as an agreement of mutual trust and support between equals, at least in principle. Though not based on utility or pleasure, it may be activated when facing lack and need. All the while, it is a fragile structure that requires continuous maintenance and renewal. As such it resembles a process, rather than an outcome. In an article The Institutionalisation of Friendship, put up for a debate by Ayatgali Tulebuek from the artist-run space Podium in Oslo who led the seventh session of the Conversation Pit, curator Viktor Misiano defines friendship as a type of serial solidarity. 3 Using an example of a group of artists from Moscow and Ljubljana that worked together in the nineties Misiano develops the concept of a ‘confidential project’, which employs friendly relations as part of its program. In a non-condemning manner he concludes that while these types of self-organised artistic projects and group exhibitions manifest a utopian position and establish a much-needed alternative to the dominant art system, ultimately their goal is to form and maintain friendships. While the article, published in 1998 and referring to the then actual world order, was clearly bound to a particular time and socio-political situation, the point it made about not excluding the human aspect of ‘confidential projects’ from art historical writing about them still serves as a relevant reminder not only for those who are penning down the chronicle, but also for cultural practitioners keeping archival records of their projects. Conversation Pit #4 with Maiken Stene. Photo: Hans Edward Hammonds. Both Misiano and Kraus suggest that blurring private life and artistic concerns is nothing to be frowned on; on the contrary, to deny that they are affecting each other would be a blatant lie. In Support Structures, and writing about the subject matter elsewhere, Condorelli considers friendship to be something that not only takes place among humans, but regards it to include alliances to things and thoughts, amongst others. Interpreted this way, one could be a friend of a sports team or a museum, for instance. Here, when applied to the relationship between art institutions and their publics, an interesting aspect of the relational template of friendship comes into view. For a small arts initiative and its publics, a framework in which establishing personal connection is feasible, regarding one another as a friend would lay the foundation for mutual recognition and trust. Disrupting typical hierarchies, it could pave the way for a fruitful dialogue, a way of learning and growing together in a sustainable manner. Curator Anthony Huberman’s Take Care, first published in Circular Facts, a book issued by a network of European contemporary art organisations, also puts forward a proposal for a code of conduct that promotes face-to-face communication and a more intimate scale. Huberman urges small arts organisations around the world to behave differently from their larger counterparts, as he sees the institutional proposition on which alternative spaces have historically been established upon as being exhausted when mainstream institutions have picked up on showing non-commercial work by non-commercial artists. Instead, a niche for small arts organisations could be forged by performing affective caring in lieu of authoritative knowing. These smaller alternative spaces, which wear their heart on their sleeve, would ideally build their audience as a result of self-selecting process out of those who also care about the artists they work with and the artworks that they show. Winsome as Huberman’s solution may be, it reveals certain problematic aspects on a closer look. For example, it leaves the matter of taste and selection making, which determines who and what we care for, unaddressed. Conversation Pit #4 with Julie Niemi. Photo: Heather Jones. On the whole, well meaning as the notion of care may be, it rests upon a particular power relation; there is one who performs caring and another who is being cared for. Though mutual care also exists, mutuality is not central to the concept of care the same way as it is integral to friendship, which simply could not exist without it. While Huberman declares that curators and art institutions should be the guest of the artists they choose to work with, and not the other way around, by and large it is curators and art institutions who do the caregiving and artists and artworks that receive it. Hence, for the former two, no real departure from the authoritative position (of knowing) takes place, even though softer values and a more affectionate air is being promoted. If the concept is to succeed in inserting generosity and gratitude into a work environment plagued by varying decrees of inequality and economic exploitation it should not be employed instead of sustaining levels of direct compensation but enacted in addition to them. Further, while discussing the notion of care, it ought be noted that it is regarded as a non-productive labour in Marxist terms. As such care work provides an indispensable foundation that enables productive labour and capitalist accumulation elsewhere. What then does it mean for small visual arts organisations to identify with caregiving and be situated within the field of non-productive labour? Certainly it is true that the fruits of their toil are likely to be collected by others. In times past it has been public museums and other major art institutions that have come together in official networks, which lobby, set standards and create procedures, gather and distribute information about the field. More recently comparatively smaller arts organisations have begun to do the same. Advocacy groups working for the recognition and fostering of smaller scale contemporary visual arts sector such as, London-based Common Practice or Swedish Klister, to name but few, have been established and exerting influence during the past decade. Conversation Pit #5 with Andreas Knaag Danielsen. Photo: Anna Ihle. By conducting research and issuing reports, networks and advocacy groups back up arguments for continued public funding and support for their members and other similar type of arts initiatives. While the output of the above named and described networks is largely centred on the production of value and more fair ways to measure it, they also strive to promote solidarity and stimulate collaboration within the increasingly competitive neoliberal arts sector. Building bridges across a horizontal plane, where competition might otherwise come in the way of collaboration, a network organisation manifests a form of serial solidarity that markedly increases the vital capacities of those involved. In this sense, joining a network of peers can be likened to entering a circle of friends. To conclude, in comparison to the notion of care that comes with inbuilt, delimiting hierarchical structures, borrowing from and building upon the relational template of friendship appears to offer, on many levels, notable potential as a fundament for a just and sustainable practice of a small-scale self-organised arts initiative. While friendship on the one hand involves getting entangled in a situation and loosing critical distance, on the other hand it is the all-encompassing nature of it that creates an environment of wholehearted support, which facilitates shaping a different, more plural, art world; a mission that is far from being accomplished, even though major art institutions might nowadays be acting more ‘alternative’ than they did before. Mirja Majevski is an independent curator based in Stavanger and Forssa, Finland. She has served as a board member of Studio17 since 2016. Her most recent curatorial projects include group exhibitions «Systema Naturae» at Kunsthall Stavanger (2017) and «Hydrodynamics» at Studio17 (2018).